"The financial crisis has disrupted the consumption of gasoline, which will have an effect on prices. However, we expect the prices that Georgian gasoline station owners receive at the pump to be in line with changes in consumers' incomes and the prices of substitutes and complements. We will not tolerate consumers taking advantage of Georgian business owners during a time of emergency." mandatory cutbacks on commercial and industrial users. had been forced to take such drastic action to save its water supply. But of course politicians love being responsible for resource allocation through command-and-control government, because it creates winners and losers and both will then donate to the next election cycle. 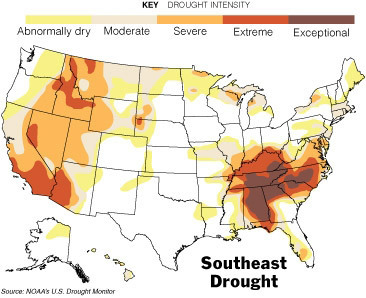 Atlanta already has fairly expensive water, but a quick 50% rate hike about 3 months ago would have likely obviated this shortage while also providing the municipality with additional funds to develop new sources. I wrote a lot more about water scarcity and the price mechanism, including the observation that Phoenix ridiculously has some of the lowest water prices in the country, here.